On the Imperial War Museum’s blogging service there was a recent post which was of interest to the Goole First World War Research Group. The subject in question was that of Portrait Window Memorials. An enquiry to the Imperial War Museum asked how rare it was for the portrait of an individual casualty to be memorialised in a stained glass window. 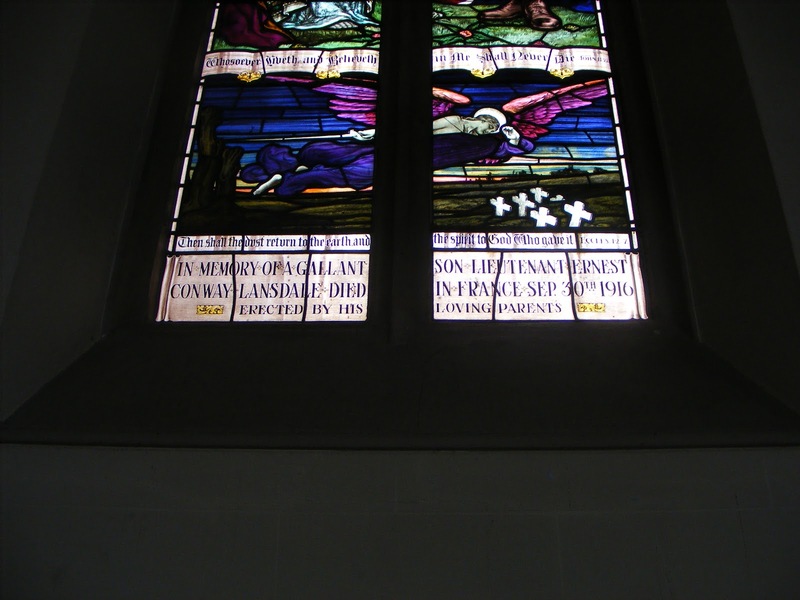 The answer given was that whilst the names of the fallen was the usual focus of commemoration on memorials some memorials do include a portrait of the dead and stained glass windows are a particularly expressive, and expensive, example of this. The Imperial War Museum has 11 definite examples of Portrait windows. The original response can be found using the link - http://ukniwm.wordpress.com/2012/12/10/portrait-window-memorials/. One such example of a Portrait window can be found in the Parish Church of St John the Evangelist, Goole. 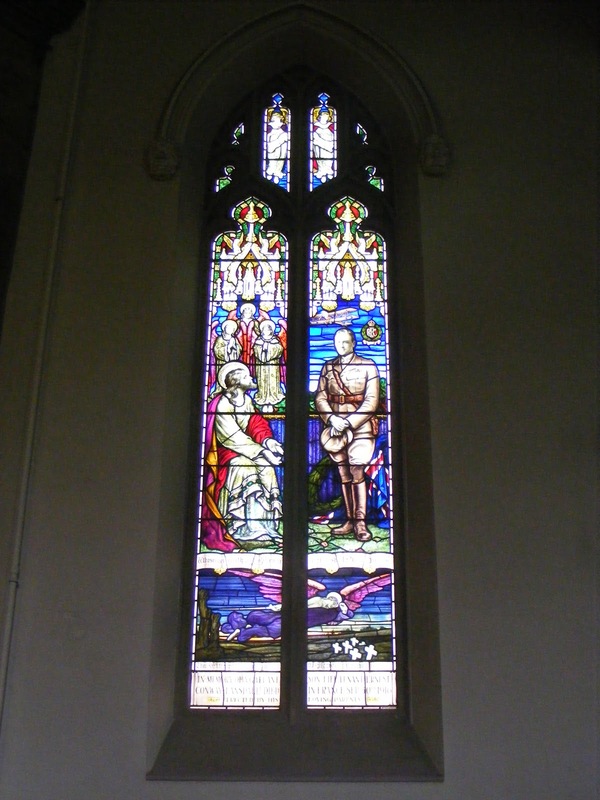 The window depicts Lieutenant Conway-Lansdale in an Officer’s army uniform and above his head the emblem of the Royal Flying Corp and a RFC aeroplane. Christ is shown kneeling before the Lieutenant and above this Angels. The bottom of the image depicts an Angel flying over a field of graves with a look of despair. Lieutenant Conway-Lansdale was a member of the Lancashire Regiment and later became attached to the Royal Flying Corp, serving in 11 Squadron. The Lieutenant is recorded as being shot down by the Barron Von Richthofen (The Red Baron) and then possibly died whilst a Prisoner of War. Born in Goole he was the elder son of Captain E. E. Lansdale, A.S.C. of Hawthorn Villas, The Grove, Ilkley. Lt Conway-Lansdale was my great Uncle and I can confirm the details as you have said. I have many artefacts including the Telegram received form the King and letters from his commanding officer. You may be interested that his brother Herbert Lansdale, My grandfather, also served in the RFC and was shot down and lost a leg whilst a prisoner of War. Thanks for commenting on the post; it's excellent to hear from the relatives of our research. The Group would be interested in anything information that you have about the brothers. We're looking at ideas for the Centenary of the war and one of the ideas could be to share the stories of the men on the Goole memorials. If you are local to the Goole area you would be welcome to attend our next meeting. Unfortunately I live in Dorset but I would be more than happy to help anyway I can. I came across this fascinating item whilst researching Ernest Esau Lansdale (Ernest Conway Lansdale's father). My interest in Ernest Lansdale snr. arises from the fact that he was involved in the raising of volunteers in Ilkley and the Craven area in September 1914. Any further information about him would be much appreciated. Yes that was my great grandfather. I do have some newspaper cuttings from the time. He was wounded in France and I believe in Hospital when news of his son's death came through. If you can let me have email addresses I can scan and send through some of the materials I have. Came across this threat whilst researching EC Lansdale (who is named on the Ilkley War Memorial) with a view to publishing an article about him in the local newspaper. Have plenty of information from the net but do you have any other information that you might pass to me.